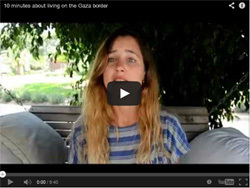 We could send you a hundred pages of written information about what it’s like to live here in Israel, but this young lady has reached the heart of the situation. I will not try to add a lot to what she has to say, but thank her for being brave and for her love for Israel and the IDF. Just keep in mind about the difference from what you are about to witness and how the other side celebrates by dancing and passing out candy when Jewish women and children are killed.